That's not all of it, but it's all that was left in the CMD window. I literally just installed Scons, downloaded the src, and ran scons on it. Last edited by Tyson on 2012-10-24, 20:21, edited 1 time in total. Tyson wrote: That's not all of it, but it's all that was left in the CMD window. Can you please state which version of Windows you use (32-bit or 64-bit? ), the version of SCons, and the version and edition (Express, Professional, ...?) of the compiler? And as a test, can you please try out the change suggested in this post? Visual Studio 2010 Professional, and the latest version available of Scons. I've made the change suggested, and it's now compiling, hopefully it'll work. Build complete, everything built fine. Funny how a simple change fixed everything! Thanks a ton, Carsten. You rock! I've got another issue now. The game loads up fine, but when I try to start a game, it freezes on 'initializing server'. This only happens on the .EXE I've compiled, if I use the original it works fine. My compiled EXE Attached (rename to cafu.exe). Tyson wrote: The game loads up fine, but when I try to start a game, it freezes on 'initializing server'. This only happens on the .EXE I've compiled, if I use the original it works fine. No file was attached to your post, and it would have been difficult to learn something useful from it anyways. Just a guess: This might somehow be related to you first compilation attempt without the "x86" setting... would it be possible that you try this again in a fresh directory with the "x86" setting right from the start (before calling SCons for the first time)? Tried in a fresh directory, with x86. No go. Re Downloaded the source, tried in a new directory. Still no go. This is the screen that it freezes at. Hmmm. Do you have some firewall running? Even for a local game, the client and the server connect to each other over a local network connection. Normally, your firewall should inform you about the connection attempt, and ask you what to do, but maybe it's setup like blocking "foreign" connections by default. If possible, please try turning your firewall off (at least briefly for testing). It may also help to run Cafu.exe with parameter -noFS, to have it run in a window rather than full-screen, where it might cover any request windows from the firewall. and post the generated console.txt file here. Carsten wrote: Hmmm. Do you have some firewall running? I don't have any firewalls on, so that's not the problem. ./RendererCgNV2X.dll ... FAILED - renderer says it's not supported. Ah! That get's us a good step closer! The fact that it cannot find "thread" is the cause for the program apparently freezing -- in fact if it happens again you should be able to open the console with the F1 key, although that won't solve the problem. I wonder though why "thread" isn't there. What does line 668 of the mentioned MainMenu_main.cgui file look like? And what version of the source code do you use? r561, r625, latest Subversion, ...? Did you make partial upgrades to an older edition of the source code or something similar? I made some enhancements to the scripting code recently, some of which were backwards-incompatible with prior versions. I did my best to only ship compressed archives that are self-contained and work properly, but now I'm wondering if there is a bug in one of the packages from the Downloads page. 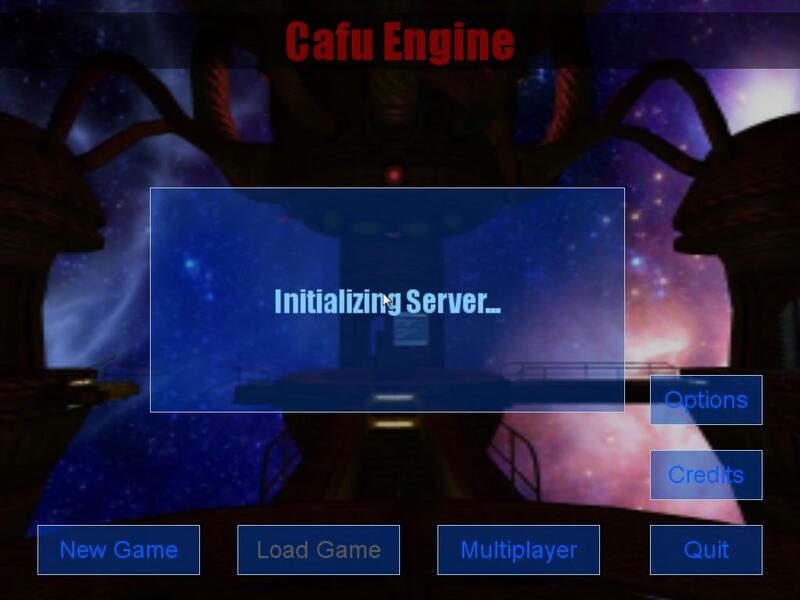 R625 src (Cafu-src-r625.zip), that might be the problem, since I took the Game, Fonts, CaWE and MISC folders from Cafu-bin-r525-win32.zip. Tyson wrote: R625 src (Cafu-src-r625.zip), that might be the problem, since I took the Game, Fonts, CaWE and MISC folders from Cafu-bin-r525-win32.zip. If you update the MainMenu_main.cgui as indicated here, things should work again as expected. I'm familiar with Git, and have used it before. Oh, and do you have an IRC Channel for Cafu? Could be useful. Tyson wrote: I'm familiar with Git, and have used it before. We have an IRC channel, but I'm rarely there. Questions etc. are better posted here at the forums, or at the mailing-list. Oh, another thing, where is the texture for the weapon projectile kept? Tyson wrote: Oh, another thing, where is the texture for the weapon projectile kept? Why do you mean by projectile?